The journey begins in the cold depths of space. ...and continues on strange and exotic alien worlds. There are places far beyond the familiar bounds of Earth. Some lie twinkling in the distant starfields, waiting to be discovered by intrepid explorers or conquered by legions of space marines. Others are just around the corner in time, a near future where hovertanks race across blasted battlefieds, cyberware replaces organic limbs, and robots serve humanity - or attempt to annihilate it. 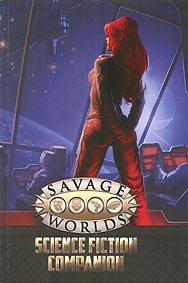 The Savage World Science Fiction Companion contains new races, Edges and Hindrances, Setting Rules, gear, cyberware, and numerous strange creatures from across the galaxy. Most importantly, players and Game Masters can now create their own robots, power armour, vehicles, starships, walkers and more to travel to the stars... and beyond!